Last night I watched the movie "Australia". It was so great! I would highly recommend it, but make sure you have time - it's three hours long. 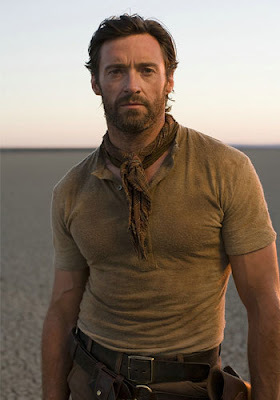 I loved all the beautiful scenery in Australia ... especially the scenery that included Hugh Jackman. 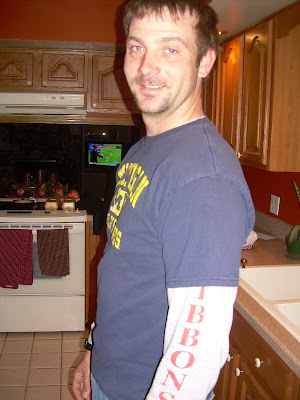 Ever since I saw him in "Someone Like You" with Ashley Judd I've had a slight celeb-crush. After seeing Australia I'm definitely a fan. Maybe it was the whole cowboy thing? 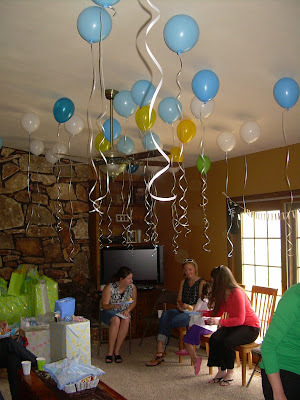 On Saturday, my mom and Kara threw an awesome baby shower open house for me. 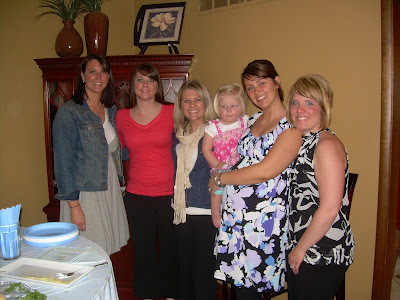 It was so fun to have so many of my friends and family over to celebrate our baby-to-be. I was so overwhelmed by all of the gifts and support we received this weekend. We are so blessed to have such a great group of friends and family to help us as we get ready to bring our little boy into this world. Kara and my mom did an amazing job with the food and decorations. My girlfriends were the best - they bought us the highchair and car seat that we will need so badly. My friends from work were so generous - they bought our little lamb swing and diaper champ (already put together!). :) My mom bought me a COACH diaper bag - what a great surprise!! I LOVE it. The best part really was having so many of my friends and family together. Thanks mom and dad for flying up and for everything. Thanks Matt & Jennifer, Luke & Allison for driving to South Bend from Roanoke. It wouldn't have been the same without you guys. Only 7 more weeks until our little boy is here! Allison, Jess & Heather in my living room. Cute balloons! 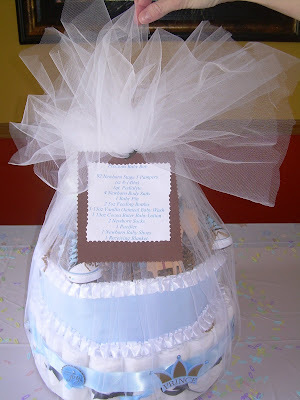 My ADORABLE diaper cake. This thing had almost 100 diapers. Notice the blue and brown theme and the little horses inside. You know me...always about the food. 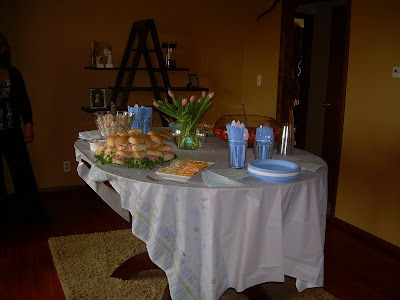 Here's some of the yummy things my mom and Kara prepared for the shower. Thanks and love you both! This is from one of those e-mails I get each weak: "By now, your baby weighs 3.75 pounds (pick up a large jicama) -- what the heck is a jicama??!?!!? -- and is about 16.7 inches long, taking up a lot of space in your uterus. 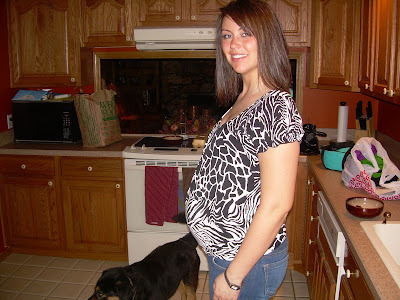 You're gaining about a pound a week and roughly half of that goes right to your baby. In fact, he'll gain a third to half of her birth weight during the next 7 weeks as he fattens up for survival outside the womb." I had my first baby shower last weekend and it was so nice. My cousin Sara and my MIL threw it for me at church. The blue and brown decorations were so cute, the food was great, and I got so many adorable baby gifts. My favorites were the cowboy socks from Heidi, the homemade quilt from Elaine, and all of the great children's books (everyone was asked to bring a children's book instead of a greeting card). Plus, all of the adorable outfits will keep our baby looking so cute for the first several months of his life. Plus - we got two strollers! One from my in-laws and one from DJ's aunt and uncle, Jerry and Rhonda. So nice! We are so lucky to have such nice family. Now I'm really looking forward to my next baby shower on April 18th. My mom and Kara are throwing me a baby shower open house and I can't wait! This is Matthew McConaughey's baby. Notice the cute boots he's wearing? Our baby got these same boots at my shower last weekend!